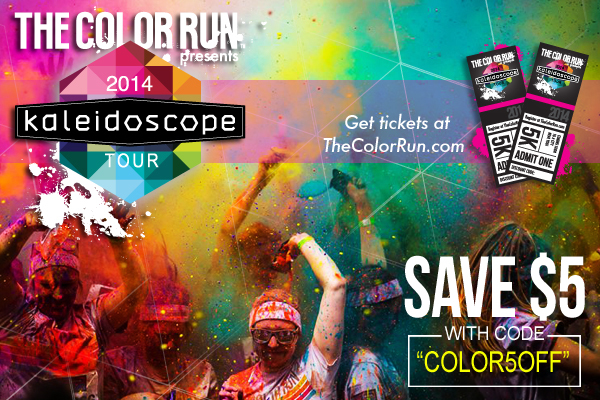 First things first as always, the winners for the Color Me Rad entries are Lori, Kaili, and Dylan Bukowczyk. Email me at kindazennish.com and I will send you your codes, congrats! I didn’t post for Meatless Monday this week because honestly I just ran out of time – I haven’t even done my weekend grocery shopping yet and it’s already Tuesday. Ever have weekends so busy you feel like you need to recover from them? Ya, next weekend I am doing NOTHING. But food is on my mind, especially since I read this Tweet Monday morning. Have any vegetarians out there done the #21daysugardetox? I’ve had the idea of trying a sugar detox for a while, but all of the information about it seems to be Paleo, which I think of as including lots of meat though I know I’ve read that there are vegetarians that follow it. But it also cuts out the majority of grains. I don’t see any reason to cut out whole grains because I think they’re healthy if you’re not gluten intolerant, which I’m not. The problem is I know perfectly well that I’m not a food expert so I keep thinking there must be some reason for it, although I couldn’t find anything on Google except for 1 person’s comment on an article (I already forgot which one) that grains eventually break down into sugar. So I’m curious. What’s wrong with including whole grains while trying to cut out sugar? I’d like to try this with my own modified plan in the next few weeks and if there is a reason to eliminate grains then whatever, it’s temporary! As long as that doesn’t include oatmeal. Anybody have an opinion on this or know the reason? Another great fun run is coming! This one sums things up pretty damn good on their web site – “Instead of running FROM something, get ready to run FOR something at this year’s Color Me Rad. Run for the hell of it.” Hey, that’s my reason for doing lots of things, this run is for me! If balloon animals aren’t doing it for you (some of them ARE kinda freaky) or if you just want to get out there and get colorful for the hell of it you can find out if they’re coming to your area here and then sign up with the discount code KINDAZENNISH15 to get 15% off. 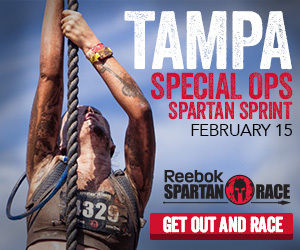 There are a ton of great races coming to Tampa, I’ve managed to about fill up my calendar through March already. What about you, do you have any runs coming up? If not you need to get one scheduled! I’ll help. The friendly folks at Color Me Rad have been kind enough to give me a few free race entries to give out! Want to win one? Just go over and ‘like’ their Facebook page, tell them kindazennish.com sent you and then comment below letting me know you did for an entry. You can also follow them on Twitter to keep up on their latest and greatest! Three winners will be randomly chosen Monday the 27th and I will announce the winner here Tuesday! A few months back I was wandering about the grocery store and picked up a little jar of red curry paste. I’m a pretty frugal person and I don’t make a habit of picking up random seemingly useless things and buying them but it sounded interesting. That jar has sat and taunted me ever since, because I haven’t had a clue of what to do with it. But it did make my spice cabinet look that much more international. Anyways, to get to the point I decided to try and make Thai food for dinner because I think that’s what you do with red curry paste. Now I have to admit up front I’ve only ever ate Thai food twice in my life and both times it was in the same restaurant. But it was good and it was spicy, so although that doesn’t make me an expert it did make me a fan. To get back to the point AGAIN I made a Thai-ish dinner which involved Japanese Buckwheat Noodles (they happened to be in the cabinet) and probably is as anti-authentic as it gets, but it was good so who cares? I very slightly modified the sauce from this post on Tasty Yummys. 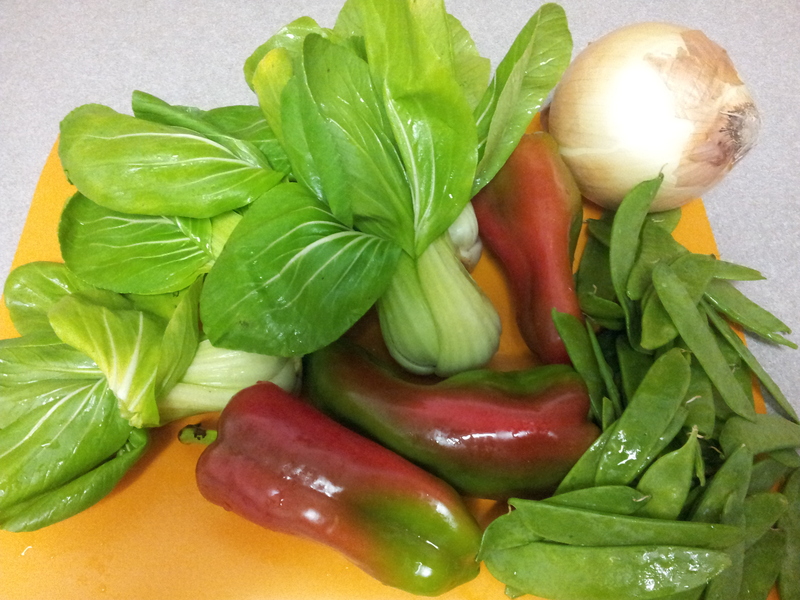 Since I again picked up some unnamed pepper at the market here’s a picture of the veggies before chopping them up. 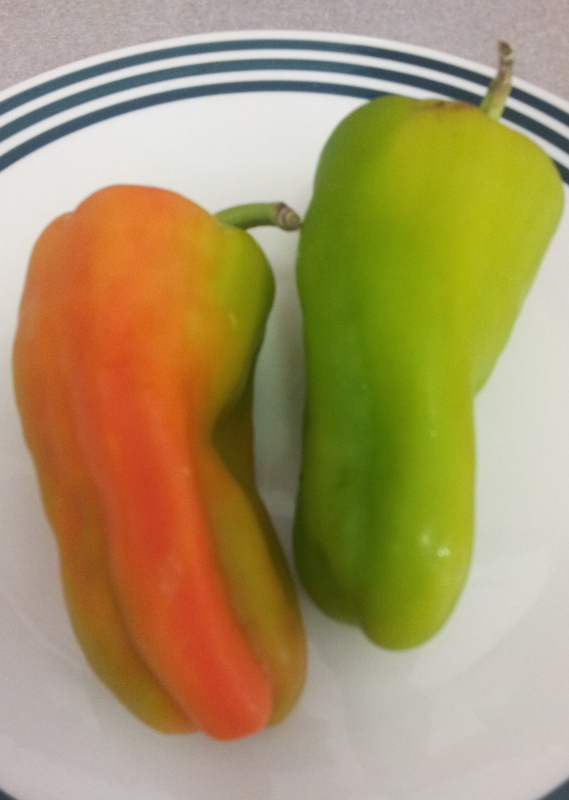 The peppers smelled and tasted like bells, 2 regular bells would be about the same thing. Heat up the oil at medium high heat in wok (a really big frying pan would probably work, but any excuse to use the wok! This was pretty good with soy sauce. I had really expected it to be spicier, I thought the red curry paste had a major kick but it really didn’t. I’ll have to aim for a super-spicy Thai dinner another time! 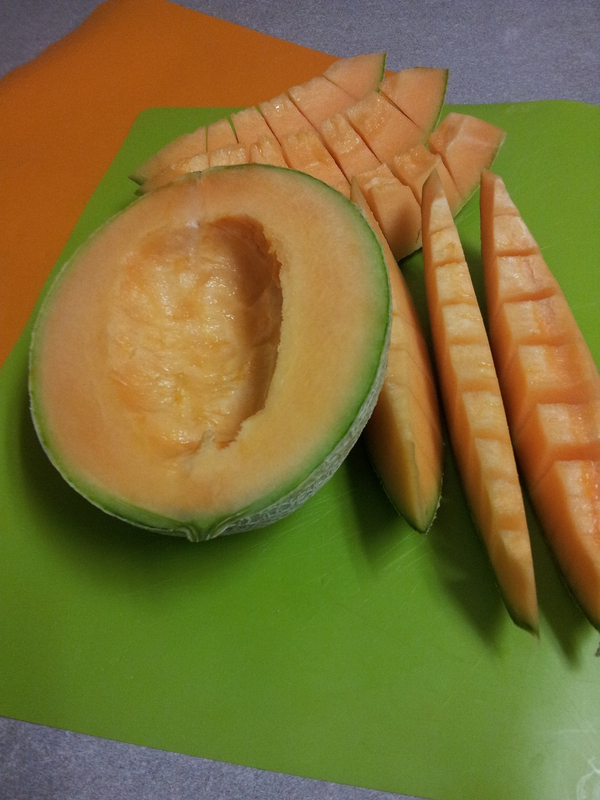 I also made a very simple fruit salad to have both as breakfast and as a snack for the week. 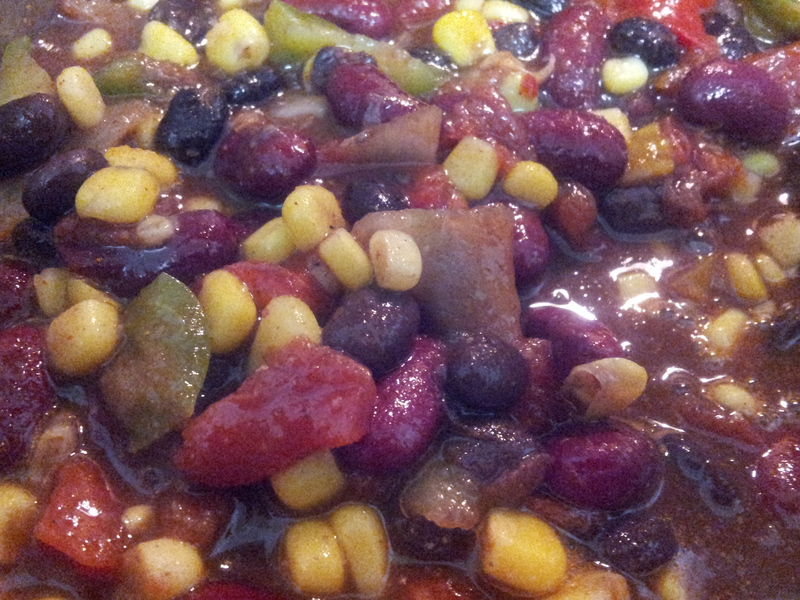 Mixed in a large bowl and sprinkled with the sweetened coconut when served. I think I’ll slice a banana into it too next time I have a bowl, it makes it feel more breakfast-y! Both of these recipes make quite a bit for my little 3 person household, but I like to eat leftovers for breakfast and lunches all week. I package the extra in meal size portions to bring to work so I don’t have to think much about it for the rest of the week. Yay to thinking less early in the morning! Happy Tuesday! First things first, the winner of The Color Run entry is Sadie B! Sadie please email me at KindaZennish@gmail.com and I will give you your entry code. Second things second, we’re more than half way through January, have you been working on any New Year’s resolutions or monthly goals? I usually don’t set any goals for the whole year but you know this year I decided to try to run 500 miles by the end of the year. The further I break it down the easier it sounds. Heck. it’s only about .057 miles per hour this year! Ya. I haven’t actually run 9 miles a week, as a matter of fact I got off to a very slow start on the running front. But I’m already picking up the miles a bit and I figure if I can keep steadily increasing my mileage I shouldn’t have a problem catching 500 at the end of the year. How are you doing with your running goals? Are you going to running this year? Yin and Yang – very loosely defined it is about two opposites that cannot exist without the other. If you want to take it about a million times looser, all work and no play makes Jack a dull boy. What does that have to do with anything? Nothing maybe. BUT. The other day I mentioned that I’ve decided to get ready for a Spartan Race. That’s going to require some hard work and dedication to do it right. But hard work and dedication can get to be a drag, so how about some really fun races on the way? How about a cross between a run and a dance party? OK, I don’t like dancing but still. 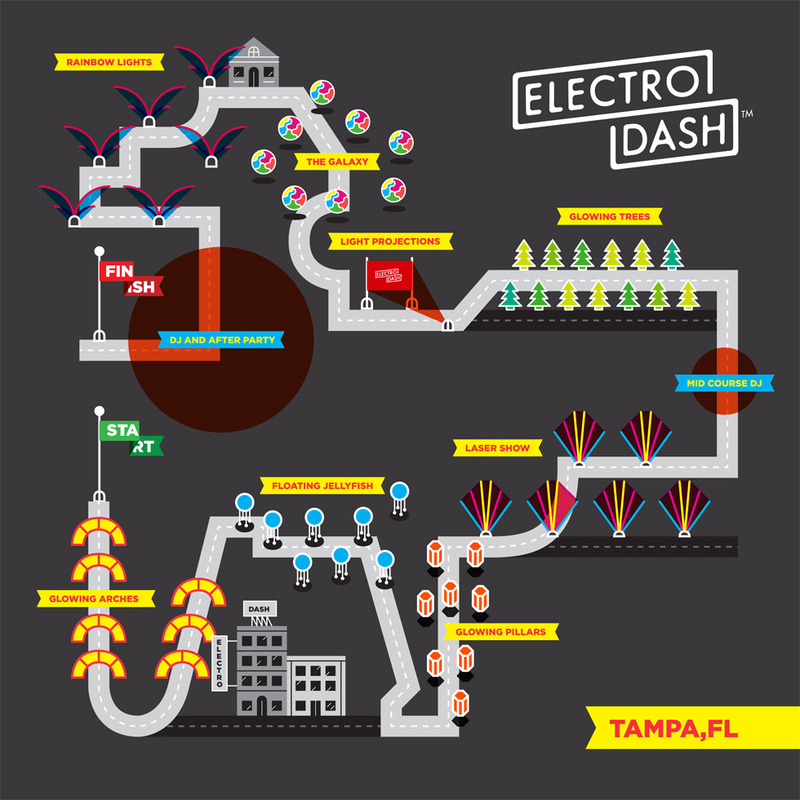 Here’s the map they published of the Tampa run. Do you see that they have glowing trees and floating jellyfish? Exactly. You want to go to. Find out if they have a run with floating jellyfish where you are! Then sign up to run, you can get 15% with the code KINDAZENNISH15. Yes, I’m doing my Meatless Monday post on Tuesday. I was ill all weekend and had made the food and all but wasn’t up to actually typing it all out. Pathetic, I know but lying doesn’t make it different. Plus I figure it’s a little like spaghetti Tuesday on a Wednesday, and what’s better than that new tradition? Second, we have a Spartan Race winner! Seth, email me at kindazennish@gmail.com and I’ll send you your code, congrats! Anyways, I’m only posting dinner this week, see above for why. BUT. It is excellent, you can have it for breakfast, lunch and dinner and still be happy. Plus a recipe for salsa which you don’t really need for the enchiladas but you must make it anyways and eat it on everything you have for the next week. I would never in a million years thought I’d have enchiladas without cheese and not miss the cheese, but that’s what happened. Just throw it all together in a big bowl, stir it up and eat with chips or over pretty much anything. I hand dice the tomatoes just because I threw them in the ninja once and it wasn’t pretty. Still tasted good though! This is one of those things that tastes better the next day if there’s any left. It makes quite a bit. If you have kids have them roll the limes as much as they will between their hands while you do the other stuff. Squishy limes = more juice. Just mix it all up in a decent sized bowl and put it in the fridge till you’re ready to roll. Ready to roll? I always put a ladle full of enchilada sauce on the bottom of the pan. Why? Because that’s just the way it’s done! I had made the sauce and filling in the morning an rolled them up right before cooking so I had to heat up some sauce to dip the corn tortillas in. I like to use a pasta bowl because they’re low and wide, perfect for dipping tortillas in. You have to dip the corn tortillas in warm sauce so they don’t tear when you roll them. The enchilada sauce will taste too tomato-y until after it’s baked. After it’s baked you’ll be hooked and will never buy canned sauce again, except maybe on those lazy days. You need less filling per enchilada than you think. Always. Cover the pans with foil and cook in a pre-heated oven at 325 for an hour. Top with a big spoonful of salsa and serve a little salad on the side to mix in and – Dinner. I made a double batch of sauce and had about half left, I made two pans of enchiladas and had a bowl of filling left that I intend to use for nachos which shall rock. I’ve never actually had a recipe for enchiladas, I always make them different but this one’s a keeper. 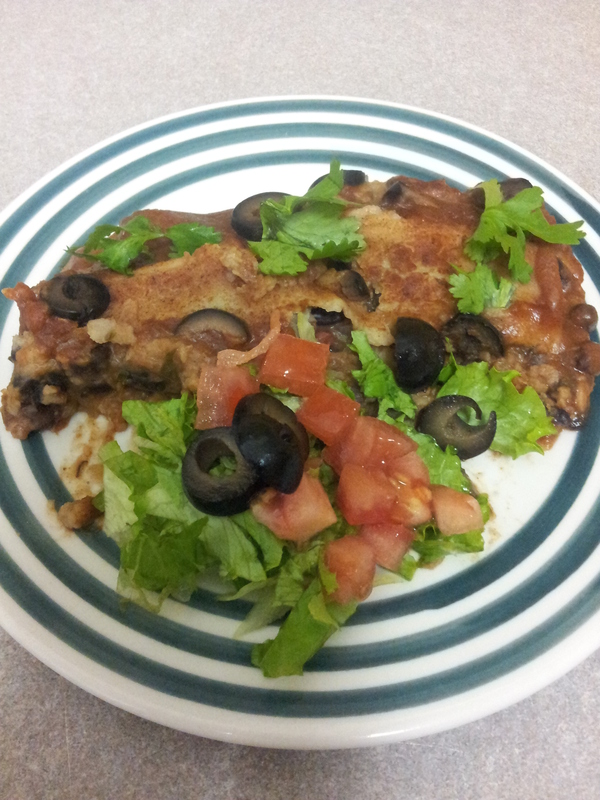 Do you have an awesome vegetarian (vegan or not) enchilada recipe? Do share here or share the link! This year I haven’t set any particular goals or resolutions yet. I’ve had two things circling round in my mind – I think I’ll set a goal of running 500 miles this year and it would really alleviate the whole single mom stressing over the holidays thing if I started putting away money for the holidays now. As luck would have it I somehow came across a blog post on Just call me B! giving me the perfect way to tie these two goals together. Pay myself a dollar for every mile that I run. 500 miles in a year equates to about $10 a week, not an amount I’ll miss but an amount that will be very helpful come Christmas! As I’m not the most crafty person in the world I’ll spare you a picture of my empty but clean pasta jar with the lid glued on. I mean miles for money jar. Whatever. Anyways, I have not just one but 2 motivators to run my 500 miles this year because I also signed up for Run This Year 2014. It’s a running community committed to run 2,014 miles, or 2,014 Kilometers in 2014. When I first read about it I thought interesting, but ya, NO. I can’t run 2,014 miles in a year – I’m lucky to hit 3 miles on my long runs! But they also have a third choice, Get Your Own Goal. Perfect! 500 miles here I come, and I have both a group of equally determined runners AND a promise of a Christmas actually pre-paid to motivate me to get there. Win and win. Do you track your miles run, miles biked, pounds lifted or something similar per year? What’s your goal for 2014? Another vegan Monday, this time I decided to keep the entire day as easy as possible. Because who says vegan has to mean difficult? I love, love, love unsweetened vanilla almond milk. It’s actually pretty sweet and really good on cereal. That was the easy part. I decided to pick up a box of Raisin Bran which goes perfect with it but at the last minute I Googled it to be certain it’s vegan. Geez. Most sites say it is vegan including PETA’s. However I found two sites that say it isn’t, first on Happy Hippie Vegan then this one with a letter from Kellogg itself. Hmmm, looks like I’ll go with Cinnamon Life cereal. That’s always been a favorite of mine anyways. Just open a bag of pre-cut lettuce and add your favorite toppings and dressing. 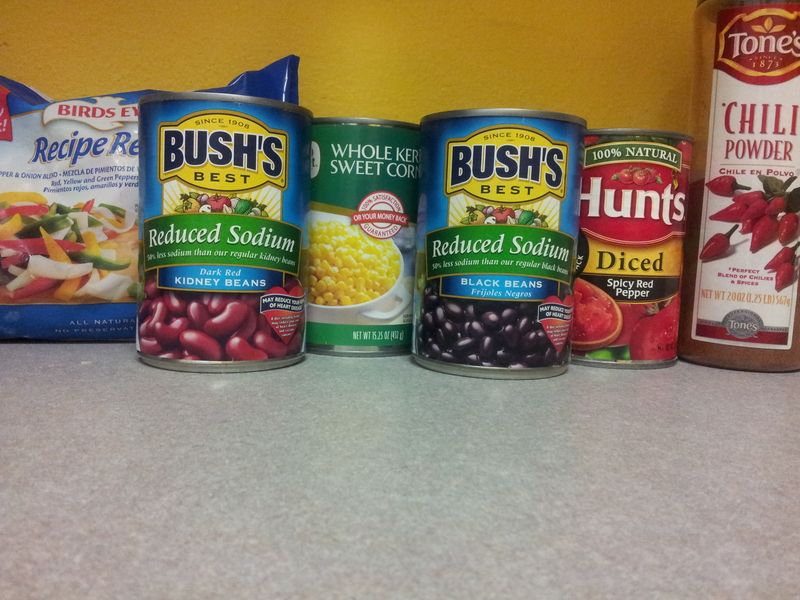 I like diced cucumbers and tomatoes and either green olives or diced jalapeno. I was reading This Crazy Life of Mine and saw a recipe for black and red chili and was reminded that it had been way to long since I’d made this chili! Her recipe isn’t vegetarian but it’s otherwise so close it’s funny, I’ve been making this for years. This is perfect for a work night when you don’t have a lot of time or energy but want a hearty meal. Brown the onions and garlic a bit, then add everything else in and stir. Let it simmer about 20 minutes and it’s done.